Sharmishtha Shenoy is a true aficionado of Agatha Christie, as she proves, not only through the title of her novel ‘Vikram Rana Investigates’, but also in the writing style she adopts. There are two thrilling episodes set in Hyderabad, both of which draw the reader into “a web of deceit, lies and murder”. Vikram Rana, the ex-cop turned private investigator, is macho and handsome with a soft corner for gorgeous women. He and Inspector Gopi Reddy (reminiscent of Christie’s Inspector Japp) work on parallel investigations, working together harmoniously to solve murder mysteries. The first story titled ‘The Mysterious Affair of the Lohia Mansion’ revolves around the murder of socialite Richa Lohia, the wife of the hard-nosed businessman, Gaurav Lohia, who dominates his younger brother, Rohan, more drawn to the arts and theatre. Rohan calls in his childhood friend, Vikram Rana, to solve the mystery of his sister-in-law’s murder. Numerous characters waltz in and out; the manipulative, failed Bollywood actor, Kalyan, his “young, ambitious and stunningly beautiful” niece, Juhi, the governess, the loyal servant, Laksmi, who knew more than she revealed, Richa’s children, Kinshuk, Gautam and Tia, and of course, Rohan, who was “ a better actor in private life than he was on stage”, as he played the roles of grieving brother-in-law, magnanimous employer, savvy businessman and protective brother, with the ease of a chameleon. As Vikram Rana introspects, putting together the various facts of the case in his mind, the penny suddenly drops and he arrives at the identity of the murderer in true Poirot style. ‘The Sonia Sinha Case’ begins with the murder of Krishna Mohan Dhavala, a kilometre from Necklace Road, and gets linked with the murder of his architect partner, Karuna Raju, six months ago. Mrs. Devika Raju, the latter’s widow, hires Vikram Rana to investigate Dhaval’s murder, not because she has any love lost for the man, but because her sensitive and peace-loving son, Pavel, has been implicated in the murder. Having lost her husband, she does not want to lose her precious son as well. Many lives are intertwined in this riveting saga – the “ravishingly attractive” Kamini Dhavala who, to Rana’s susceptible heart, appears “like a beautiful fragile flower”, her close friend, Janaki, who helped her in her time of need, Janaki’s pretty daughter, Khushi who is Pavel’s childhood sweetheart, and Bilas, Kamini’s driver who lives a suspiciously extravagant lifestyle. The story stems from the murder of Krishna, an unscrupulous land grabber, wife-beater, murderer and blackmailer, an unsavoury character if there ever was one! 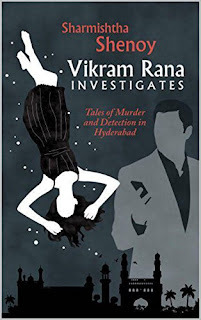 Once again, Sharmishtha Shenoy proves that she is a brilliant storyteller as Vikram Rana picks up all the clues, discards the red herrings, and finally pounces on the actual murderer. This book has all the elements of a modern whodunit. The chapters are short and pithy, and the titles hinge around the characters who play prominent roles. The language is clean, shorn of unnecessary descriptions that slow down the tempo, and both episodes hurtle towards their climaxes at breakneck speed. The only minor glitches were in the few printers’ devils in the punctuation, which could have been caught by the editor. Verdict: A highly fast-paced book which whets the curiosity of the reader till the end!